Feeling the effects: Ed Parrott and Rhiannon Daye, front, with Denise Williams, Dave Smith, and Alison Trombley in Side Effects. 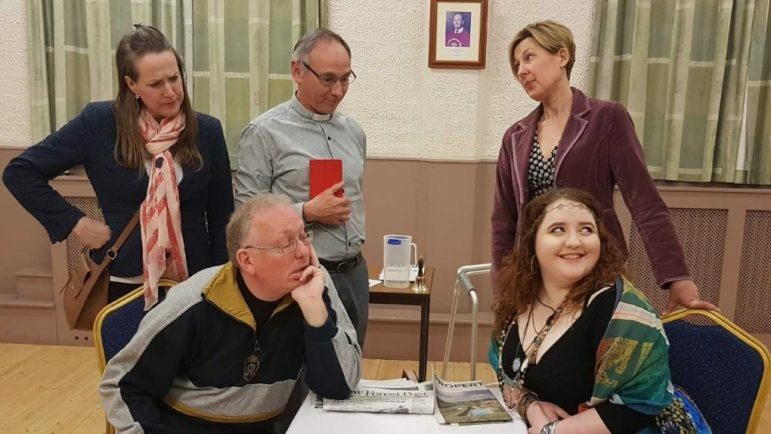 WYTHALL Theatre Company are staging the top comedy Side Effects by the BAFTA-winning creator of Rising Damp, Eric Chappell. Set in the intimate Palace Studio, the story tells of Frank Cook, who, having been taken ill with a rare complaint, has been booked into a private nursing home by his wife June for a week’s respite. Whilst there, he encounters the Reverend Paul Latimer who is recovering from a heart transplant and whose odd behaviour is beginning to alarm his wife, Sarah. The young, attractive Tracey might provide the answer…. She is convinced that the vicar’s new heart belonged to her recently deceased lover Melvin, a fairground wall of death rider. Could it be that Paul has taken on Melvin’s personality traits as well as his heart? That would explain the swearing, the smoking, the drinking and the clandestine canoodling with Tracey in the rose garden….not the usual traits associated with being a man of the cloth. Then again, perhaps he’s just suffering from the side effects of his medication? The show runs from Thursday, April 4 to Saturday, April 6 and promises to be a real hoot.